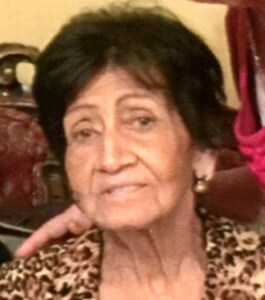 Martina Ruiz, age 89, of Orlando, Florida passed away on Tuesday, February 5, 2019. Better known to everyone as Ana, her reserved nature, beauty, and elegance made her seem a bit mysterious. Her hair and makeup just so, a fashionable purse, and a touch of animal print, and she was good-to-go. She came to New York in 1946 and married the man of her dreams, Agustín Ruíz, in 1947. She devoted her life to raising her daughter and son, Annie and Joe. A sweet grandmother ‘Wella’ to Arlene, Johnny, Denise, François, Cathy, Jackie, and Andrea. A great-grandma to Chelsea, Kyana, Devontae, Angel, Francoise, Jaylen, Clemente, Virginie, Evan, and Zachary. A great-great grandma to Lailanee and Santino. She welcomed in-laws as loved ones. Esmeralda and Carmita were like her sisters, Papo regarded her as a second mom, and Judy and Yvette were like a daughter and granddaughter. Ana and Agustin hosted legendary parties at their home on Marcy Avenue in Brooklyn. How many people can fit into a two-bedroom apartment in Brooklyn? They probably broke records. The food was delicious, the drinks plentiful, and the music loud. After moving to Florida, life was quieter, but still rich with friends and neighbors who became extended family-Olga & Ulises, Ana Torres, Cindy & Terry, Maria & Mima, Anabel, Mari, Nanda & Genio, Nilda, Mickey, Enrique & Josefina, and Irma & Rey who they met at the airport when they first arrived in Orlando and who also happened to be coming from Brooklyn! Friends and family flocked to their home in Orlando for the company and Ana’s culinary skills. Her dishes were legendary: pastelillos from scratch, lasagna, pasteles, arroz con dulce-all served with humility. In her final moments, she blessed most people with numerous “Te amo” said with all of her diminishing might, but she didn’t wait for her deathbed to express her love. Her whole life, her daily actions, were dedicated to love of family and friends. Visitation is Saturday, February 16, 2019 from 3:30 pm to 7:00 pm at the Newcomer Funeral Home - East Orlando Chapel, 895 S. Goldenrod Rd, Orlando, FL 32822. Funeral Services will be held on Sunday, February 17, 2019 at Newcomer Funeral Home - East Orlando Chapel, 895 S. Goldenrod Rd, Orlando, FL 32822, with Chaplain Daisy Santiago, officiating. Burial will follow the funeral service at Chapel Hill Cemetery, Orlando, FL. To share your memories of Martina or leave a special condolence message for her family, please click the Share Memories button above. Add your memories to the guest book of Martina Ruiz. Dear Annie and Joe and and family my deepest condolences and may God comfort you at this time of loss. Mi querida Ana que brille para ti la LUZ Perpetua y que descanses en paz. Les quiere Letty la hija de Cuchi y Mery. Childhood Neighbors, Makeup, Latest Hair Styles, Impeccably dressed, Grocery Store, Secret Door to Living Room, Birthday Parties, Great Food, Caring, loving, great smile and eventually wella to all us at 590 Marcy Ave. We love you, May god bless your soul and may you rest in peace. Love cookie and family. My Deepest condolences to my dear friend Annie and family...you have lost a beautiful soul.. Dona Anna was a loving, giving person and great mom...may she rest in peace in God's loving embrace.. por Ultima ves le dire "Que Castigo" la quiero mucho ? My heartfelt condolences go out to the Ruiz family. May the God of all comfort sustain you during this difficult time. John, sorry to hear of your grandmother’s passing. While we did not know her, we are sure her death leaves a great void in your life. Please accept our sincerest condolences. of your Mom will always be in our hearts. When someone we love falls asleep in death, the memories we have of them becomes our treasure. May those cherish memories and God’s promise at John 6:40 bring you a measure of peace and comfort during this most difficult time. I remember Tia Anna as a gentle and beautiful lady when she visited her family in Chicago! May you Rest In Peace with your love ones that await you in heaven. Rest In Peace Tia we will miss you! Love you Nellie and family. I love you, I love you, I love you! Thank you so much, I promise I will never forget you! A very nice lady, mother, grandmother and friend. She and Don Agustin (her late husband) were very good friends of my mom and dad Josefina and Enrique “Quique” Quinones. A beautiful family, may she Rest In Peace as she watches her family from heaven. Que descanse en paz.